FiveStar Decorative Art turns ordinary wooden surfaces into extraordinary and distinctive showpieces with striking faux-bois decorative painting and finishes. Claudia and Guenter Goertz founded FiveStar Decorative Art when Claudia discovered this classic way to refinish and texture furniture. Claudia's love of wood originated from her work as a fine antiques restorer, "I enjoy creating finishes with the warmth and depth of fine woods." Fueled by her natural ability to create and a passion for restoring furniture, Claudia has perfected her skills and can turn ordinary wood a beautiful work of art. Imagine the possibilities or see for yourself! 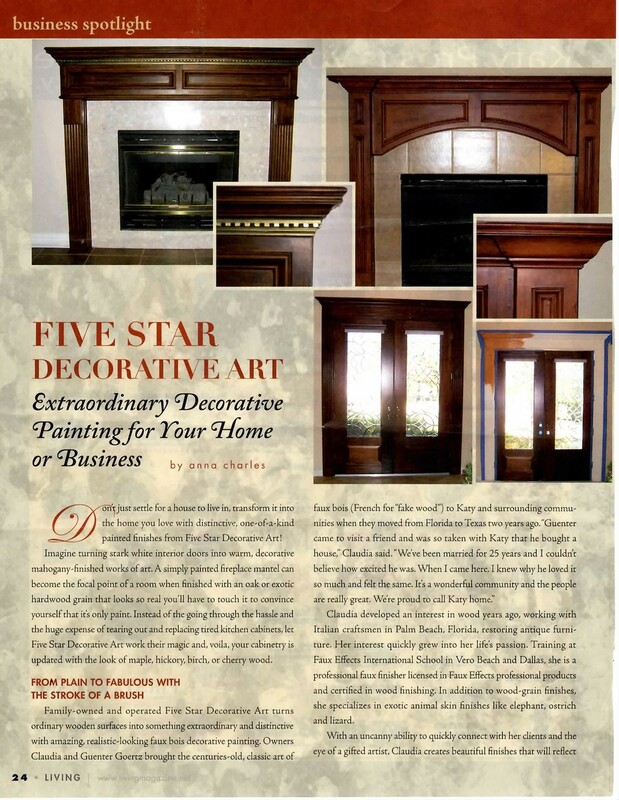 Let FiveStar Decorative Art turn a mantle, table, entertainment center, or cabinetry in your home from plain to fabulous with the stroke of a brush! Customize and personalize your home with breathtaking faux-bois and distressed wood finishes.